A lot of money goes into starting a business. Not only must you spend money on important resources, you must also spend money on your company’s home base; your commercial property. Commercial properties consist of a number of different components. One of the more important components of a commercial business is its roof. Because of this, you need to wash and maintain its roof on a regular basis. “But why?” you might ask. This is why a regular commercial roof washing is important. Whether your business has a flat roof or a slanted roof, it’s bound to get covered in all types of dirt and debris. What you might not realize is that the existence of this debris actually hurts the roof’s energy efficiency. When debris is present, it will not reflect, but absorb the sun. In essence, it will draw more heat to your roof. But when you clean your roof, you rid it of this heat-attracting debris. This allows the roof to reflect the heat from the sun, reducing the amount of heat which can seep in. Just as debris on your roof will attract heat from the sun, it will also attract moisture. In essence, when rain or snow falls down, instead of just rolling off the roof, it will seep its way into the debris. There is no other single entity which destroys a roof quite like a moisture. Allowing moisture to sit in one area on your roof for too long will likely result in cracks, tears, and deterioration. By cleaning your roof regularly, you rid it of the moisture which can do it so much damage. When you own a business, the safety of the people on your property is paramount. If one of your employees or clients were to be injured on your property, you would be subject to some very serious legal liability. For this reason, you want to make sure that everything on your commercial property is as clean and tidy as possible. This includes your roof. 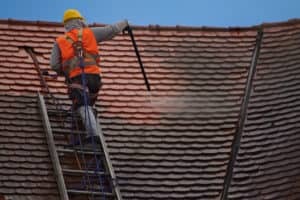 A roof washing will not only remove potentially hazardous, falling materials from your roof, it will also make your roof as safe to go up on as possible. When it comes to attracting customers, aesthetics and advertising are hugely important. It doesn’t matter whether you own a restaurant or an accounting firm. Your commercial property reflects your ability to actually do business. For this reason, you want it to look as good as possible at all times. This includes its roof. A roof cleaning on a regular basis will ensure that your customers and clients always have something nice to look at. Looking For a Commercial Roof Washing? If you own a business in the Nashville area, and you’re looking for a commercial roof washing, we here at Pro Wash are just the people you need to turn to. Our team of power washers is well-versed in the process of commercial roof cleaning. We’ll have your commercial property’s roof looking and functioning like it’s brand new.